Aviation safety management leaders Ideagen Gael Ltd has become the first Western company to present at the Civil Aviation Administration of China’s prestigious safety conference for carriers and airports. Chief Executive Officer, Ashley Marron, was a specially invited guest to the conference, which was held in Kunming, China, on Wednesday, October 9th, and delivered a successful presentation on aviation safety management, in particular the changes between regulators and their regulated organizations. I was honored to be asked to the event and found the two days hugely informative. I came away with a clear understanding of the many challenges they face in regards to SMS implementation and I hope we can continue to use our experience to help and work with them on their journey. Ideagen Gael was invited to the prestigious event following a series of successful projects with aviation regulators such as the General Civil Aviation Authority (GCAA), the UK Civil Aviation Authority (UKCAA) and Trafi, the Finnish transport agency. During a 30 minute speaking slot, Mr. Marron addressed 75 delegates from across China before his presentation covered the subject of technology, and how it is helping to improve the relationship between regulators and their regulated organizations around the world. The event, entitled ‘The 1st International congress on Implement; Sharing; communication of SMS’, provides aviation organizations from across China with a platform to discuss improvements in aviation safety. Thomas Zhang, Ideagen Gael’s Aviation Business Development Manager in the region, added: “Despite there being language differences and cultural diversity during communication, I learned a lot from the event. 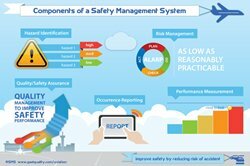 Ideagen Gael is a leader in aviation safety, with over 300 organizations globally benefiting from its safety management system, Q-Pulse. Ideagen Gael’s project with the GCAA, the aviation regulatory body for the United Arab Emirates, saw them improve relationships with their 500+ organizations, driving improved audit practices and consistency. Meanwhile, other successful projects with the UKCAA and Trafi have resulted in improved risk management and regulatory accident and incident reporting.